The following is a presentation I gave at the Israeli Mobile Summit in June 2014. The presentation would have probably been more aptly named “Five common freemium app marketing mistake themes”, since each “mistake” actually represents a number of different tactical errors made in building a freemium app’s user base. Of these mistake themes, those related to LTV are the most likely to put app developers (especially smaller developers without existing revenue streams) into difficult cash positions. LTV, ultimately, is an abstraction; it’s an easy way of thinking about how much a user is worth to a product. What LTV is not is cash in hand: the delayed and volatile nature of LTV realization poses a short-term cash trap that many app developers fall into by looking at LTV as an immediate recoup of marketing spend. But even if LTV could be recouped immediately upon marketing spend, LTV needs to cover more than just the expenditure of acquiring new users: it must also cover operational costs. The LTV > CPI construction describes marketing profitability, not overall firm profit. 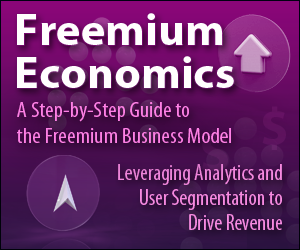 This is where scale in freemium becomes an important component of an overall business strategy: the larger a freemium product’s user base, the slimmer its marketing margins can be to achieve the same level of aggregate profit. But that aggregate profit is the goal, not simply an LTV greater than CPI, since the grand sum of those margins has to cover not just marketing expense but the cost of maintaining the app (and the company). The second most problematic mistake theme is the interplay between chart position and CPI (these are broken out into distinct themes in the presentation, but they’re obviously closely related). The smaller the total addressable market for an app, the faster CPI prices will increase as marketing campaigns achieve volume. This is because the mobile advertising ecosystem is market-driven: those users most likely to click on an app’s ad and subsequently install it tend to do so after the first few viewings of that ad. Since CPI is determined by CPM adjusted for click-through rate, and because click-through rates drop as the most enthusiastic potential users are eliminated from the market (having already installed the app), CPI prices can rise precipitously in a very abbreviated timeframe if a developer is attempting to reach a visible chart position. Finally, misunderstanding the nature of mobile ad networks can oftentimes lead app developers to spend more money on mobile marketing than they need to (or should). One aspect of mobile advertising that’s often overlooked is the fact that most mobile networks are competing to fill (and sell) the same pool of ad inventory across a limited number of “sites”, or mobile apps. Very few mobile networks preside over exclusive inventory; as such, no one network has a monopoly on “quality placements” (and thus none can genuinely guarantee “higher LTV users” than what the rest of the market can supply). Obviously ad formats play a role in the return on investment from ad campaigns (eg. video generally costs more than interstitial but produces higher ROI), and new ad formats are gaining traction that some networks operate exclusively, but generally speaking, most networks can’t promise appreciably better inventory than the average (or, rather, they can promise that but shouldn’t). This reality has a knock-on effect: networks “affiliate” ad placements to others — eg. you work with Network A to advertise your app but Network A has no impressions available, Network A passes your ad to Network B, Network B passes your ad to Network C, and Network C shows your ad in an available impression. This behavior is generally bad for developers because each network in the daisy chain takes a transaction fee, meaning each time the ad is passed, the bid is reduced. Networks tend to not be very transparent about how they affiliate ads to other networks, and so developers can end up overpaying for terrible ad inventory by virtue of having their ads passed to three, four, five, etc. different networks. In the presentation, I refer to this as ad networks not being frictionless: transaction fees (and especially unnecessary transaction fees) can substantially reduce the effectiveness of a developer’s marketing budget.